Article details: "Control of an Asymmetrical Design of a Pneumatically Actuated Ambidextrous Robot Hand" edited by World Academy of Science, Engineering and Technology (WASET), International Journal of Electrical, Electronics, Communication, Energy Science and Engineering. Volume 8, Number 5, pages 990-995, 2014. 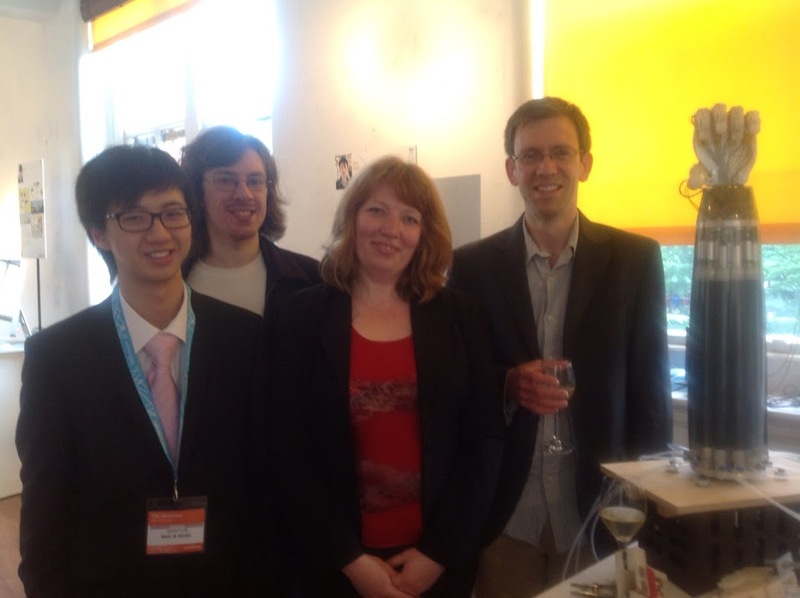 (Co-)Authors/researchers: Emre, Anthony H. and Dr Kalganova. Article details: "Remote-Controlled Ambidextrous Robot Hand Concept" edited by Journal of Computer Technology and Application (CTA), David Publishing Company, USA. Volume 4, Number 11, pages 569-574, November 2013. (Co-)Authors/researchers: Emre, Alexandre, Fabrice, Zhu, Souraneel, Itziar, Michel, Dr Paramonov, Dr Turner, Prof Stelarc and Dr Kalganova. 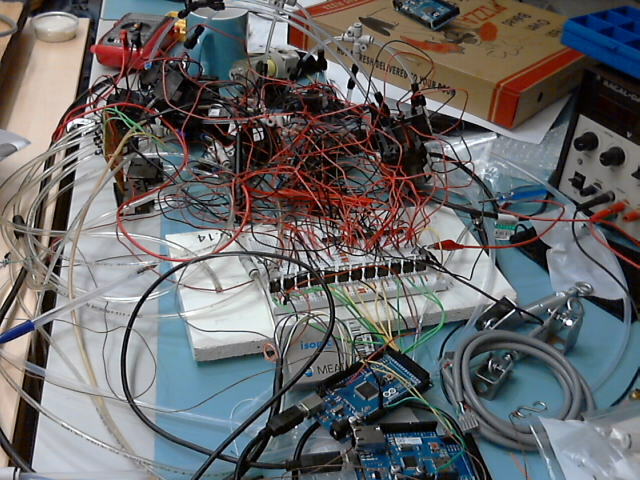 -Three interns from ESIEE Engineering join the project to make the robot hand controllable through internet, with an embedded webcam, to provide vision on the hand from a remote computer. Such a model is finally reached. The only problem is that the two distal phalanges cannot flex together when the proximal phalange is close to a vertical position. 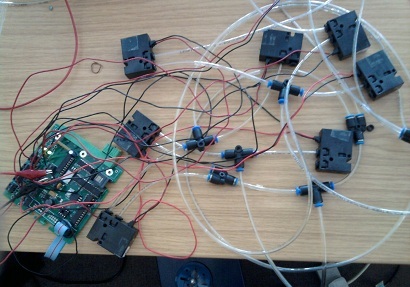 New tests can be done with sensors. 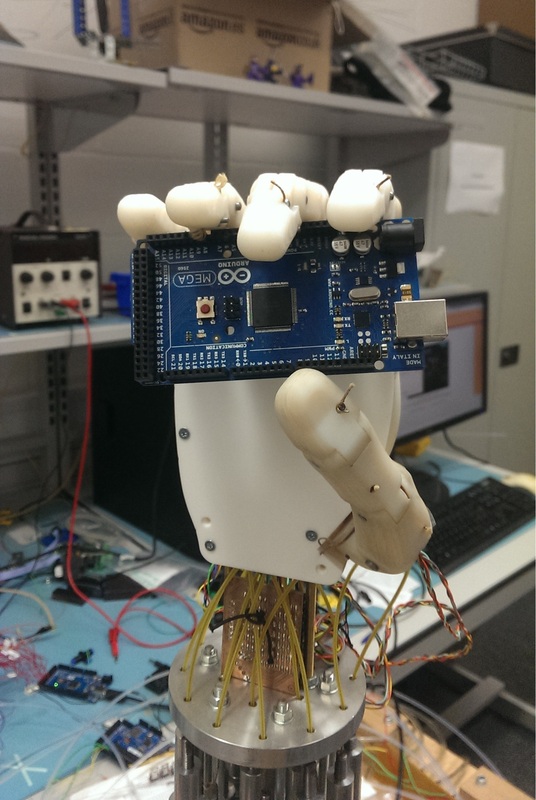 Using Shadow Robot´s program, the angular behavior of the finger can be controlled from a second sensor. Tests with force sensors are successful as well, the finger is both able to provide enough force to hold a piece of metal or go back in another way when it detects a piece of paper. The next step would be to rebuild a second non-ambidextrous finger to do tests about grasping objects. 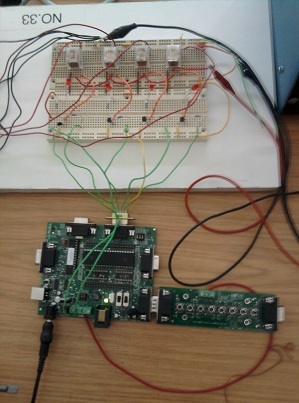 Using Shadow Robot´s program implemented in the microcontroller and Dr Turner´s advices for PID control, the tests using an angular sensor are successful. Souraneel uses torsion springs instead of classic springs. The forces provided by these ones are opposite to muscles´ contraction, which limit the movements of the prototype. To imitate a human behavior, the finger must be able to flex and extend keeping either a left or a right behavior, which is impossible on Emre´s model but theoretically possible with Souraneel´s one. The two designs needs to be combined. Dr Turner proposes Emre and Souraneel to come to Robotville´s exhibition at Science Museum. This is an opportunity to have a very close look on the DEXMART hand and meet Prof Claudio Melchiorri from University of Bologna. Souraneel joins the project for his academic UG project. 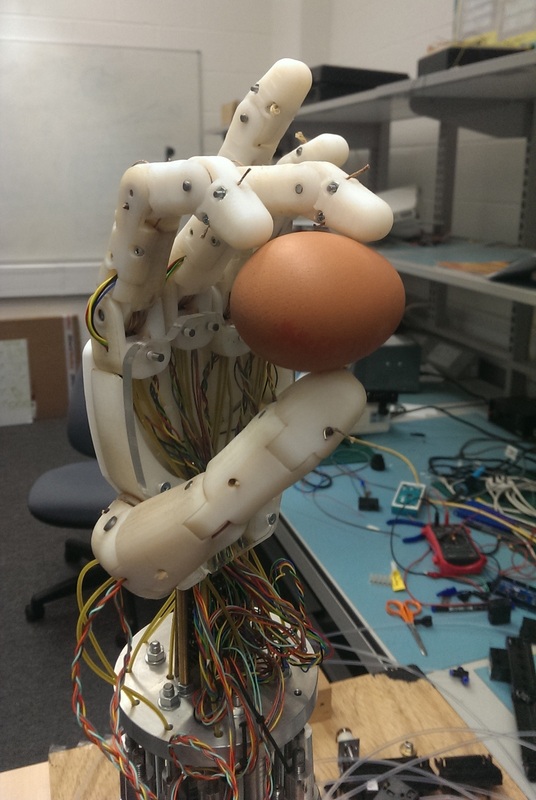 After a couple of weeks he is convinced that a spring-returned structure would ease the control of the finger. Emre reaches an acceptable ambidextrous behavior using the principle of lever, coupling small wheels to bigger ones. To minimize the number of actuators, Prof Stelarc asks if it would be possible to control one finger with two muscles instead of four. All the attempts end in failure. Different architectures are still tested to reach a better behavior. At the end of the internship, two fingers are controllable from the computer program. Each of them is connected to two air muscles but they are not ambidextrous and their movements are very limited. Emre asks to stay longer and to extend his internship´s term. Dr Kalganova proposes him to carry on working on the project as a PhD student. -Before coming to UK, Emre was supposed to do his engineering internship in Tokyo, which was cancelled because of Fukushima disaster. -The English translation of "Emre Akyürek" is "Pureheart Disciple". The initials make PhD. -Half of students who worked with Emre agree to say he is crazy. -Emre and the Ambidextrous Hand are both born on a 13th June. -Emre and Anthony H. planned to marry each other in January 2014, so Emre could obtain the English citizenship, and consequently a scholarship they could share together. The wedding was cancelled a couple of days before its due, after Dr Kalganova said a period of two years was necessary for nationnality transfer. 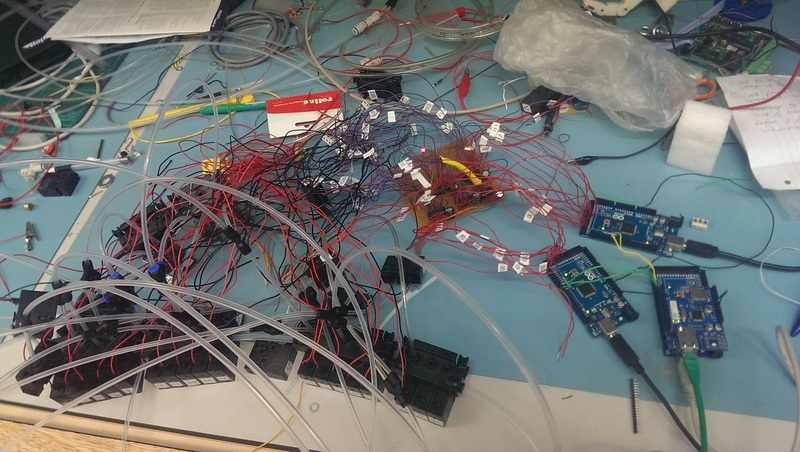 -During his whole PhD, neither taking the final month nor the electronical connections into account, Emre worked for less than 2 weeks on the Ambidextrous Robot Hand's movements.